The Golf Lounge is our modular world of experience. Driving range on three areas, Lounge Bar, Outdoor Bar, patio and diverse activity planes — those are your opportunities for incentives of every size. Gladly, our golf pros accompany your activity program. We consult you on how to best stage your brand and communication strategy — from activity program to catering idea. Just give us a call, we are looking forward to you. The word “incentive“ stems from Latin and means “to spark enthusiasm“ — we take this in a literal sense! 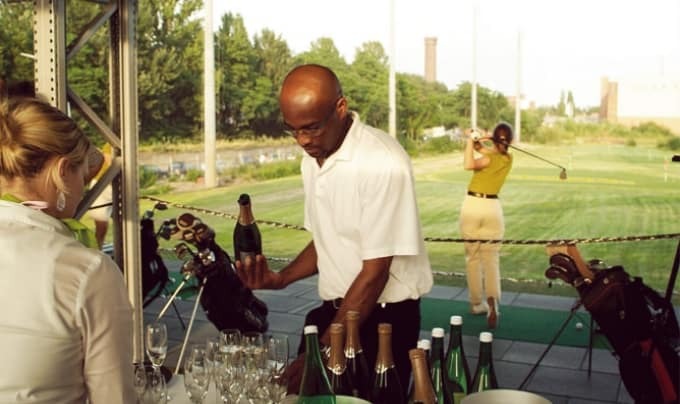 At your event at the Golf Lounge, your employees and business partners will be very much inspired by taking a swing! With an entertaining and active “rally“ through every facet of golf, our diverse activity program provides for group dynamics and delicious highlights. With this, I want to thank you cordially for an amazing organization and great service at the Golf Lounge. All around, it was a successful event. The food was delicious (surprisingly, many men ate salad). Please also give our compliments to your kitchen staff and the service team. The happy winners of the Golf Trophy already got back to me and thanked me a lot.